...from Hubby. He thought they were too busy and he wasn't overly fond of the colours (yes, I did ask for his opinion) and he could be right, but I'm going to blog them anyway, because I can ;-). 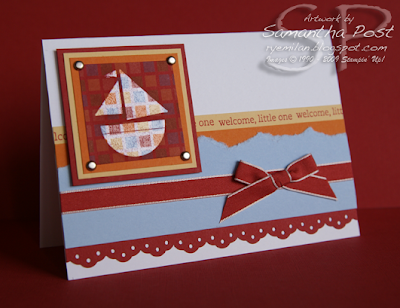 The colours I have used for these cards are: Riding Hood Red, Pumpkin Pie, Bashful Blue, So Saffron and Whisper White. 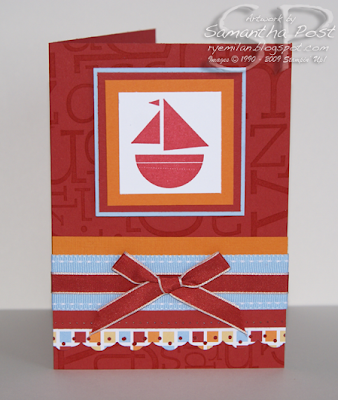 The Designer Series paper is from the Washington Apple pack and the stamps are from Stampin' Up! 's Nursery Necessities and Party Hearty stamp sets. 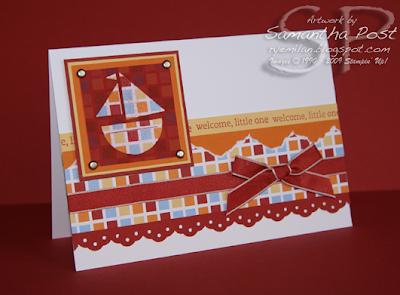 I have also used the new eyelet border punch and the Riding Hood Red taffeta ribbon. Hey Sam! I dont think their too busy at all......in fact I reckon their FUNKY!!!!!!!!! So glad you posted them too! what do hubby's know anyway Sam? I think they look bright & fun - What did you do with the boat on the 3rd one? - glitter? 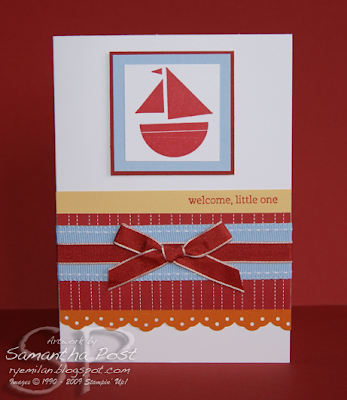 Just as well you're the cardmaker in the family and not your DH! Those "busy" cards were cute! and as for the colour combo who can go wrong when you stick to the DSP combos? I like your cards! 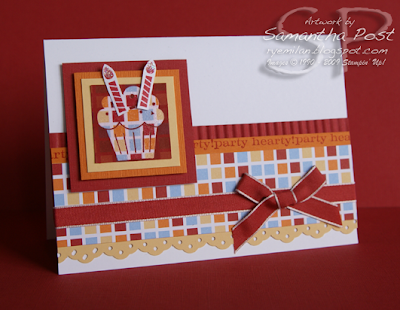 And I agree that you can't go wrong when you stick to the dsp colours! I really love that one with the daisies and en francais bg....just awesome! Now you've got me wishing for a magic carpet to take me away to somewhere sunny, warm and no wind!!! LOL!!! I think they are perfect - as Karen said they are a little bit funky! Great work! Hey Sam. I think you have done great work with the cards that the hubby doesn't like. Always great to stop by here and see what you have been doing. Susan Boyle is awesome. I am loving the posters too. As for the magic carpet ride, right now I would go somewhere, anywhere that colds and flu's didn't exist...so over this cold. But when I am in a better frame of mind, top of my list is Rome and the Cinque Terre in Italy, closely followed by Serville, Spain...although if that carpet could go via a couple of scrapbooking stores in the US on the way home, I wouldn't be complaining....hmmm...better get back to the real world and the groceries. Well I really like your cards Sam, no matter what your DH says lol!! I especially love the last 2, and wowzers the last one using the En Francais b/g is STUNNING!!! Where would I be today? Wow that;s hard one!! To be honest I'm really happy where I am today - we've been having a mini heat wave here in the UK the past few days which has been heavenly, but if I had to choose probably Italy! I love these colours that you chose I think the cards look gorgeous. No, he's wrong! All these cards are gorgeous!! My DH will often give the same comment :) it's good to know they are all similar.